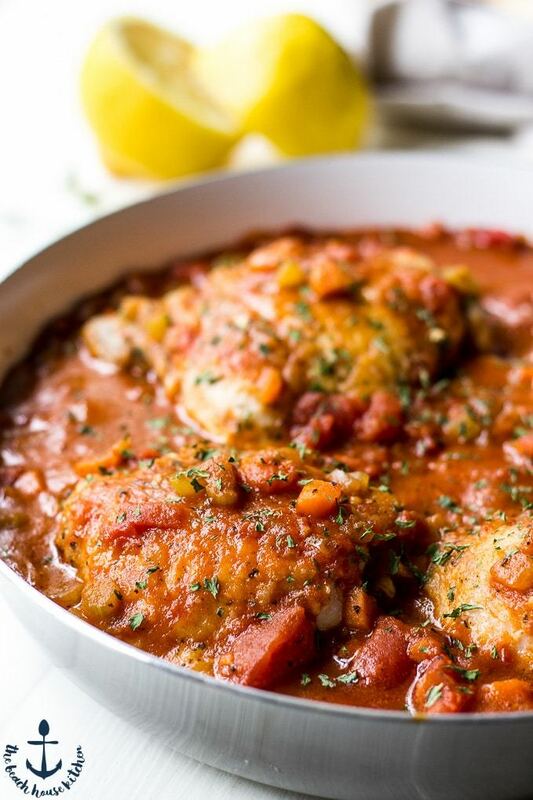 This Chicken Osso Buco is rich, comforting and over the top full of flavor! Rinse chicken thighs, pat dry with a paper towel and season both sides with salt and pepper. Place flour in a shallow bowl, and dredge each thigh lightly in flour making sure to shake off the excess. In a large skillet, heat 2 Tbsp. olive oil over medium high heat. Add four chicken thighs to the pan and cook 3 minutes per side, until lightly browned. Remove thighs to baking dish large enough to hold all 8 chicken thighs. Add the remaining 2 Tbsp. olive oil and repeat with the other 4 chicken thighs. Pour off all but 1 Tbsp. of the olive oil and add 2 Tbsp. butter over medium heat. When butter is melted add onion, carrots, celery, garlic, oregano, thyme, salt and pepper. Cook until softened and lightly browned, stirring occasionally, about 20 minutes. Add the wine and increase the heat to medium high. Cook for 3-4 minutes, scraping up any brown bits until the wine is reduced. Stir in the tomato paste, then add the tomatoes and the broth and bring to a boil. Pour the mixture over the chicken thighs. Cover the baking dish tightly with heavy duty aluminum foil. Bake at 400 degrees for 45 minutes or until meat is no longer pink. Before serving add the lemon zest and the parsley. I like to serve over pasta or risotto.